sailboat. : January 2013 GlossyBox. I originally started writing this post with a little introduction about how underwhelmed I was with the January GlossyBox, but after going through and looking at everything, there are a few products that I'm actually quite looking forward to trying. There's no denying that this months box isn't very exciting, it's probably one of my least favourites but I've learned that you can't always judge purely on first impressions. Instead of including a small-ish card with all the product information on, this has changed to a mini-magazine style piece of paper, which inside has a little note from the GlossyBox team, a little new years resolutions feature and, of course, all the product information. I quite like this new format although the plain paper makes it feel a little, well, cheap almost. A glossy piece of paper would be much nicer I think and fit with the whole GlossyBox theme a little better. Perhaps that's just me being overly picky though? 1. 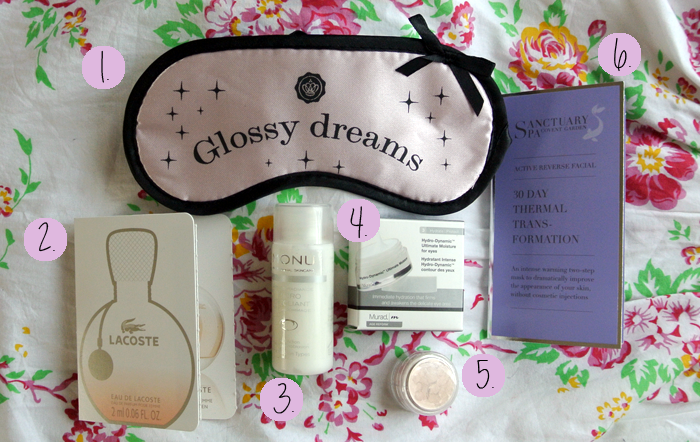 A little GlossyBox extra - an eye mask. 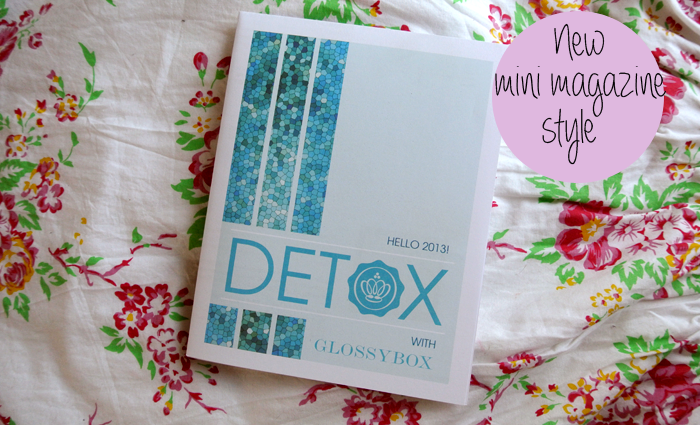 This is cute, fits in with the whole detoxing theme for the box and the little bow is a sweet addition. I can't say I'm going to use it because if you know me I can sleep anywhere, anytime, even if I'm not tired. I would say I'll pass it on to my boyfriend, who is the worst sleeper in the world, but I'm not sure he'd wear it & even if he did I'm not sure he'd like me to tell the internet about it! 2. Lacoste Eau de Lacoste perfume. My feelings on perfume samples haven't changed, I'm not a fan because they're so small and fiddly and I always end up spilling the contents everywhere while trying to get the worlds tiniest stopper off the worlds tiniest bottle. With that being said, I actually really like the scent of this. It's very simple, floral and classic. I could see myself purchasing a bottle of this for the spring time. 30ml retails for £33. This promises to deliver instantly radiant skin and over time to refine skin texture while reducing the appearance of fine lines & pores. It's no secret I'm a bit of a sucker for an exfoliant so I'll be sure to give this a try. I'm not overly keen on the scent, it smells a bit like savlon but if it helps my skin then I'm sure I'll get used to it. 100ml retails for £14.50. 4. Murad Hydro Dynamic Ultimate Moisture for eyes. The second skin care sample this month comes in the form of an eye cream and this is probably the thing that I'm looking forward to trying the most out of everything. I still haven't found my perfect eye cream which actually slightly annoys me because I know how important they are. This promises to hydrate without being too heavy and quite frankly I hope it's bloody amazing because 15ml retails for £57! 5. BM Beauty Dewy Perfection Finishing Powder. I've received a few samples from this brand in previous boxes and I have really liked them. My only slight negative is that they've all come in these tiny pots, which to use them properly is a bit of a faff. I don't think there's any way around that though and I'm sure the full sized packaging is much nicer. This is a translucent powder made with natural ingredients that when used over foundation promises to give you a really air brushed finish. The dewy part intrigues me because if it really delivers then this may become my new favourite powder because I have super dry skin and powder usually only ever accentuates dryness. A 4g pot retails for £8 & just for reference, this sample is 1g. 6. Sanctuary Spa Active Reverse Thermal Transformation Mask. Apparently with this mask, results are instantly visible but it also goes on to say that it's only with continued use you'll see the most benefits. I'm sure this is a lovely product, there's just something about it that doesn't excite me. I'll certainly give it a try though because I'm interested to see if it lives up to its claims! A full size is £27.50. I have to say that I like sanctuary products!! I will deffo see what you think about it, though! I am so very in two minds about Glossybox..I erad such mixed reviews but I suppose it is a good way fo trying things..
p.s eye creams are such a tough one...I have never found one that I like enough to stick with! So many fo them give me spots too!! There are definitely good boxes and bad boxes, I think some of the other variations of this month's box were better than the one I received but that's okay. It must be super difficult to come up with an amazing box each month! Ahh I know what you mean, I'm not really liking this Murad one too much, it seems a bit heavy. May try a clinique one next? I don't think I could ever get a monthly beauty box.. I'm far too fussy and probably wouldn't like anything I got! The exfoliant sounds good. I'll look forward to the review! I got mine for review which I am currently writing. It was extremely underwhelming. I had seen from the ambassadors what box they got and they at least got 1 full size product, I think that is where my grimace lies as this just seems like a sample box. Shame. I am excited to try the eye cream. I hope it has results at 57£ a unit!! I actually adored my December box. That one was fantastic. So hit and miss of late. Eye mask is so cute! Wish I was still signed up to get glossybox to get that! The Monu exfoliator sounds lovely! It's quite reasonable too, I'd love to hear how you get on with it. I was quite happy with this months box, I got the Monu micro exfoliant, the Sanctuary mask, some Premae rose facial toner, a Jason lip balm and the one I was most excited about because I could smell it before I opened the box! a Paul Mitchell Tea Tree body bar, which is really zingy and fresh. Have to agree with you about the new style magazine, I like the extra bits and pieces of info on it but the quality isn't great, looks like something I printed on my home printer and I would prefer something glossier looking from a company which prides itself on supplying high-end products. These look a great bunch of products! wow i must try this glossy box! 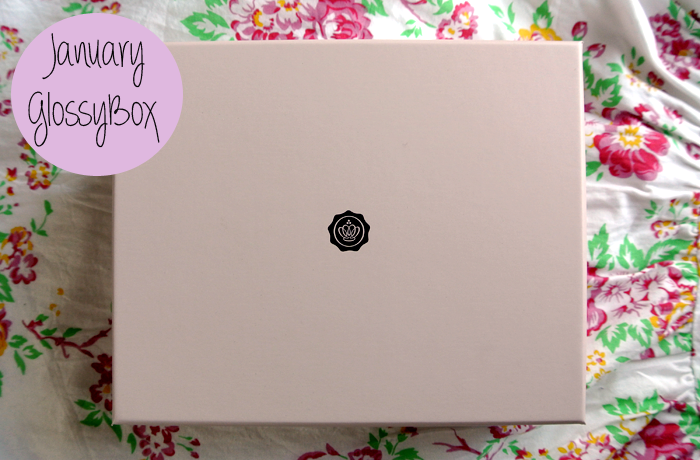 This is a lovely month of Glossybox! I love the eye mask! Like you said its not the most exciting box. I think the only product I would want to try is the Murad eye cream. I wish the Sanctuary Mask was a bigger sample. We've had a few last year but it's so hit and miss unfortunately. Saying that, if I had the extra cash I'd probably subscribe again! I would love to subscribe to Glossybox, it'd be so fun to try all the different products! The eye cream sounds good... I am also in search of another eye cream to try! So far my favorite has been the Clarins Eye Balm, but I'm curious to know what you think about the Murad one!